The beauty and serenity of the yurt and its surroundings may make you want to stay put and relish the seclusion. But if you do want to roam, there are lots of things to see and do in the nearby area. The farm has direct access from your yurt’s location, to open moorland where, whichever direction you set off in, there are walks with dramatic views. There are several Tors within walking distance, and the River Dart runs across the Moors, providing many stunning settings for picnicking – or natural pools to swim in if you can brave the water temperature! One of the oldest pubs in England, the Tavistock Inn, is just down the road from the farm, with a great selection of ales, beers, and wines, good food and a huge outside seating area. The nearest town is Ashburton where you will find several antique shops, delis and cafes. Or head over to Totnes which has been voted one of the 10 most funky towns in the world! It’s a haven for alternative therapies and independent shops. Check out the hugely popular market on Fridays. Dartmouth is famous for its regatta. It’s a great place if you are a boating enthusiast or if you like history. Or if you want a bit of city life Plymouth and Exeter are both 40 mins drive away. 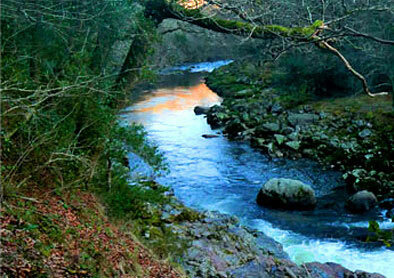 The River Dart has some of the best white water in the UK. There are several places locally to hire kayaks. Wild swimming: Dartmoor has “possibly the most magical wild swimming in Britain” and you will find some perfect places to swim within walking distance of our yurts. Dartmoor has ideal terrain for riding horses, offering unrestricted access to mile upon mile of striking land over which to walk or ride. 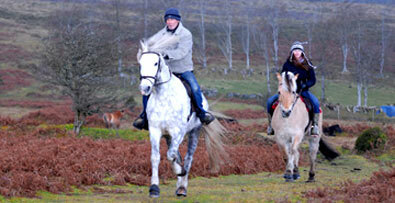 There are many riding schools nearby which we can put you in touch with during your holiday. If you have your own horse and are keen to bring it along with you for an incredible riding holiday, we have our own stables and grazing land and we can arrange this with you at a small additional cost. 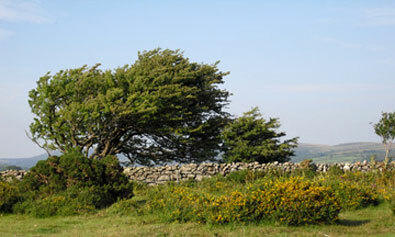 Dartmoor is the perfect place for walking. You can walk for miles and not see another person! 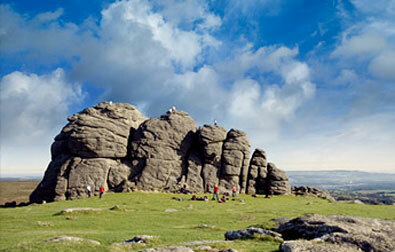 Spectacular scenery, windswept moorland, ancient woods and tors to climb. There are several beautiful beaches to choose from but our favourites are Bantham which has wonderful golden sand and is famous for its surfing and Blackpool Sands which is set in a cove surrounded by trees and is an award winning ‘Blue Flag’ beach.